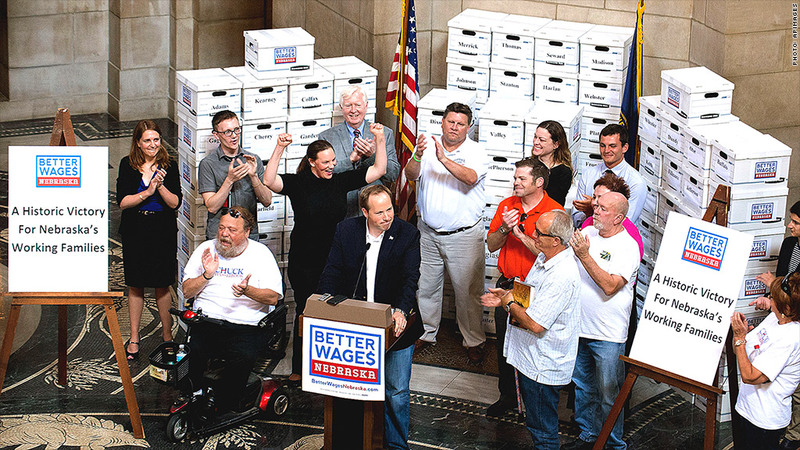 Nebraska is one of four states where proponents of a higher minimum wage collected enough signed petitions to include a proposed increase on the states' November election ballots. It's mostly been Democrats beating the drum to raise the minimum wage this year. But come Nov. 4, there's a chance that voters in four Republican-leaning states -- Alaska, Arkansas, Nebraska and South Dakota -- will approve ballot measures to increase their minimum wages. Polls have shown that a majority of the public in those states favor an increase. And if history is any guide, "minimum wage measures usually pass," said Lou Jacobson, deputy editor of PolitiFact and state politics columnist for Governing magazine. The measure could be derailed in Arkansas, however, by a legal challenge still working its way through the courts. Three of the states' current minimum wages are at or slightly above the federal minimum of $7.25 an hour, while the Arkansas state minimum is a dollar below. The biggest proposed increases are in Alaska (from $7.75 to $9.75 by 2016) and in Arkansas (from $6.25 to $8.50 by 2017). If the ballot measures pass, Alaska, Arkansas, Nebraska and South Dakota would join 12 other states and Washington, D.C., all of which have moved in the past two years to raise their state minimums. A fifth state, Illinois, will also put a non-binding referendum on the minimum wage before voters in November. The proposal: To raise the base hourly wage to $10 from $8.25 today. Like a public poll, the referendum is a way for voters to send a message to state lawmakers. A couple of West Coast cities, meanwhile, are also getting in on the act. San Francisco has a proposal on its ballot to gradually raise the city minimum to $15 an hour by 2018 from $10.74 today. And Oakland, Calif., has a ballot initiative that, if approved, would raise the city minimum to $12.25 by March 2015, up from $9 today. In Los Angeles, there's no ballot measure but the mayor is trying to push through a higher minimum wage -- to $13.25 from $9. In the past year, other cities have approved increases. Most notably, Seattle opted to gradually raise its $9.32 minimum to $15 -- the highest in the nation. The increase will be phased in by 2017 for large businesses and by 2021 for all businesses. Action at the state and city level has far exceeded that in Congress. 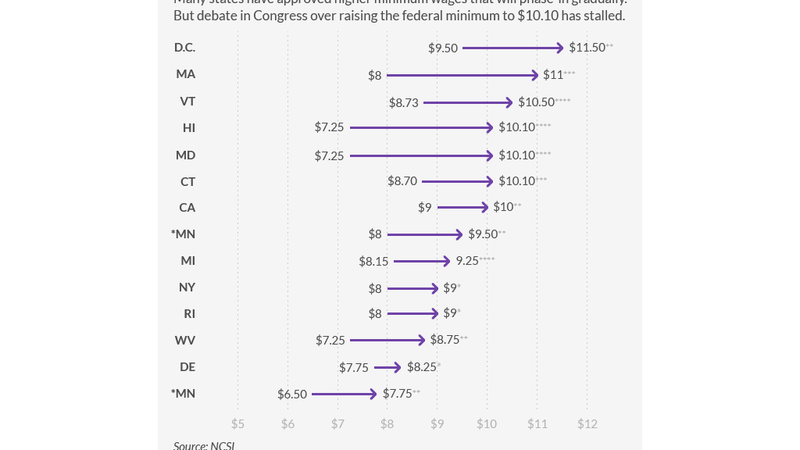 The push by Democrats to raise the federal minimum to $10.10 an hour hit stall speed even before legislation was introduced. President Obama, meanwhile, issued an executive order requiring companies with federal contracts to pay their workers at least $10.10. Any success in raising the minimum wage doesn't necessarily mean all types of low-income workers will benefit. A patchwork of rules and exemptions let employers pay some kinds of workers less than the full minimum wage -- including those who work for tips, those who are disabled, and those who are teenage trainees.